Recently I watched Pure Imagination: The Story of Willy Wonka and the Chocolate Factory, the making-of documentary included on that film’s 40th Anniversary DVD release. It’s got all the expected behind-the-scenes tidbits (the chocolate river was just cold water with brown dye in it) and some interesting trivia (Quaker Oats paid for the movie, with the intention of releasing a Wonka Bar to coincide with the film’s appearance in theaters, only to encounter a problem in the formula, causing the bar to be scrapped). There are also interviews with all the grown-up “Wonka Kids” as well as with a sort-of doddering Gene Wilder, who played the iconic chocolateer in one of cinema’s most beloved performances. Well, you know, it wasn’t a success when it came out. And I heard some talk about mothers who thought it was cruel to the children. What they—and everyone else—found out later on was that maybe some mothers felt that way but the children didn’t feel that way. The children understood the movie very well: that there are limits. And they want to know the limits. And it’s reassuring to know that someone can tell you what the limits are. And that’s what Willy Wonka did. 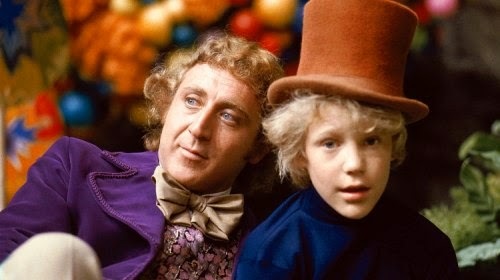 It’s certainly true that, in order to find a “good child” to give his kingdom to, Wonka winnows out the “bad children” (who, in turn, eat too much, watch too much television, are too spoiled, and—of all things—chew gum too frequently) by unceremoniously dumping them from a tour of his factory. But this plotline is for the adults! Now, Gene Wilder may literally be the only person on the planet who thinks that “There are limits” is the point of Willy Wonka and the Chocolate Factory. Tragically, there are millions upon millions of people who believe that “There are limits” is the point of Christianity. Jesus has created a world in which we are free. And, of course, it’s better than a world of pure imagination…it’s quite real. There is only one “good child,” and it’s not us…nor is it Charlie Bucket. This good child, the only son of our Heavenly Father, has been given for us and will also give us all things. Jesus is the end of any limits set on love because he is God’s love for the over-eating, TV-watching, and whining people of the world. He is for us. When we eat like Augustus Gloop, rot our brains like Mike Teevee, whine like Veruca Salt, and …um…chew gum like Violet Beauregard, we are not kicked off the tour. Because of Christ, we still get our lifetime supply of chocolate, our ride in the Great Glass Elevator, and our trip up into the heavens.